For buyers of flexi-labor we focus on convenience and fostering ongoing relationships with work-seekers. Intermediaries get control and new opportunities. For this fictitious transaction imagine you are duty manager at a residential care home in Los Angeles. The home specializes in a healthy regime, with frequent exercise classes for residents. It’s Wednesday, 7:45AM. You want to organize a class on the lawn sometime today. You need a worker to assist the coach. 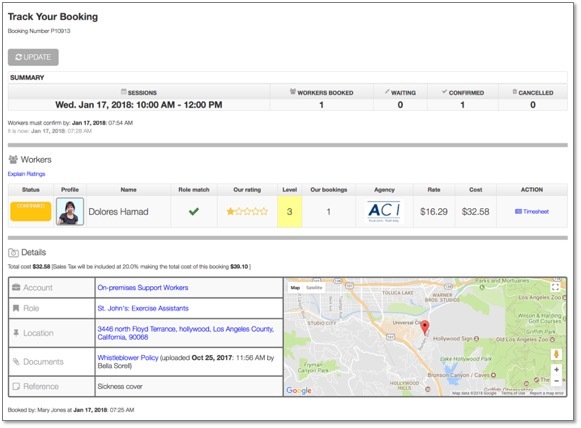 The care home is a client of staffing agency Angeleno Care Inc. For clients needing top-up or ad-hoc workers, Angeleno offer the area’s CEDAH (Central Database of Available Hours), rebadging it as “ACI Flexi”. You are authorized to make bookings. Your employer has set up budget controls, you tell the system which you are spending against. Then it needs to know what Role (type of work) you need. The care home has a specific Role “Exercise Assistants”. Managers have described the work, the minimum Verifications required and set a fixed pay rate. The system has then offered that opportunity to its qualified local work-seekers. A pool of 15 have been approved and currently have the Role set at Active. The system then asks where you want the work done. Like all the entries on this screen, it stores your most common selections, so you can whizz through these inputs. You can select the hours for this booking, or enter more finely tuned requirements. 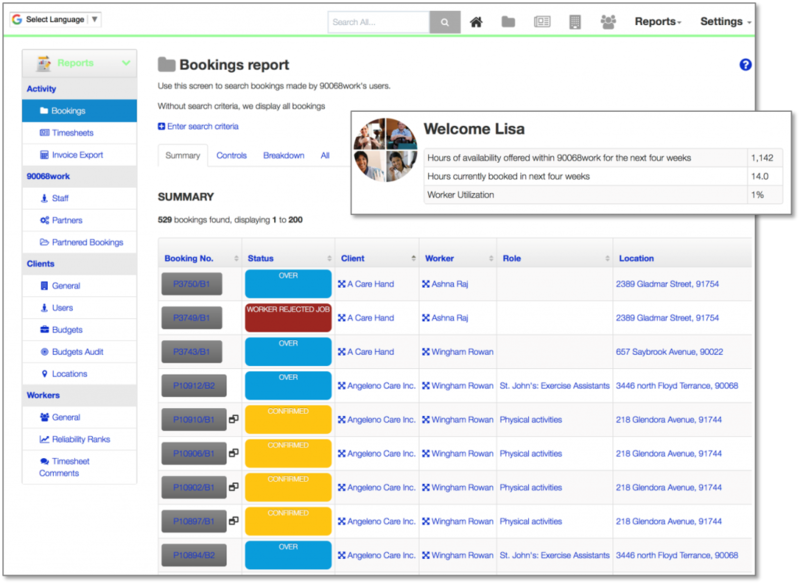 It’s easy to create a regular booking that goes on week-after-week. This could be a stepping stone to a formal job offer for the workers involved. You decide to hold a class between 10:00AM and 12:00AM this morning when 7of your pool of exercise assistants are available. The system shows who they are. To keep introducing you to new work-seekers, the system has also found 11 who are qualified to do physical activities with elders but who aren’t currently part of your pool. They are displayed below. Everyone on this screen is available at those times, qualified and willing to do your booking if you will pay the hourly rate displayed. Your care home can have a rating for any worker, typically used to record the level of induction they have received. Their rank (next column) is an objective recordof reliability across the market. Has the individual shown they do what they say they will do? 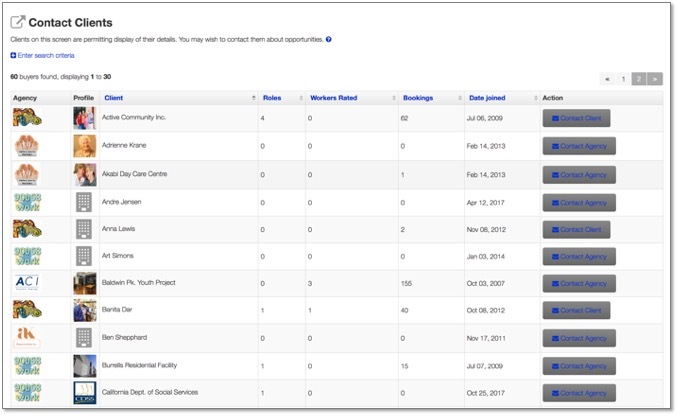 You can list work-seekers by who has done the most bookings, or hours, at the care home. Angeleno Care Inc., your labor market intermediary has chosen to partner with other local agencies. So, work-seekers from those partners are displayed while the platform is building the margin-split agreed in each case into the hourly charge. People from your pool have accepted your fixed rate, the others are priced according to their rules applied to this requirement. Tax, pro-rated benefits and other on-costs are all part of the rate. 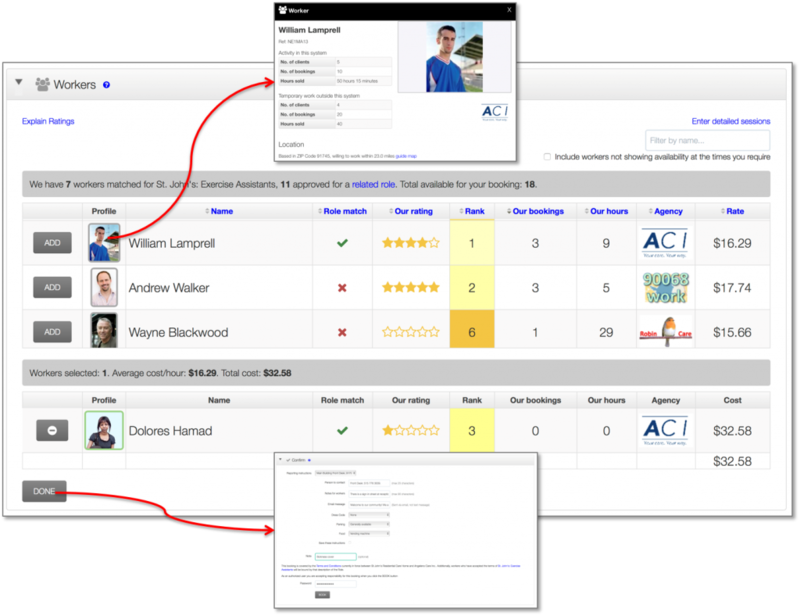 You can browse a profile of each individual by clicking their photo. But if you’re time-pressed booking can be very fast; the people at the top of this list are those in your pool with the highest rating for your organization. A couple of clicks will sort everything. 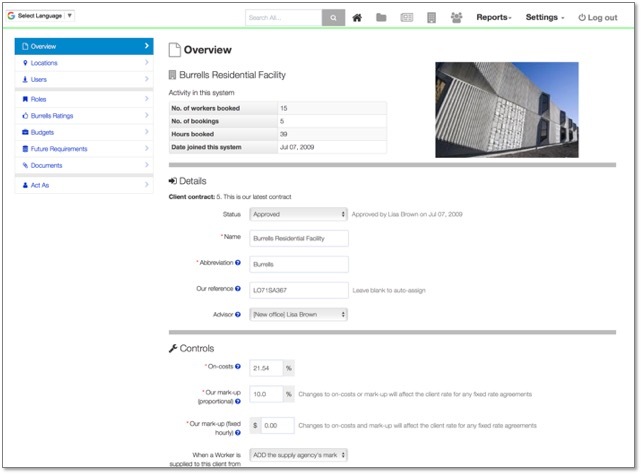 Once you have clicked for the worker(s) you want, you are asked to select reporting instructions. Re-entering your password confirms the booking. 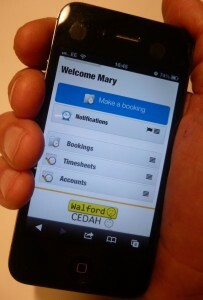 As workers confirm, a timesheet is created for any booking. Extra hours can be added if both parties agree. 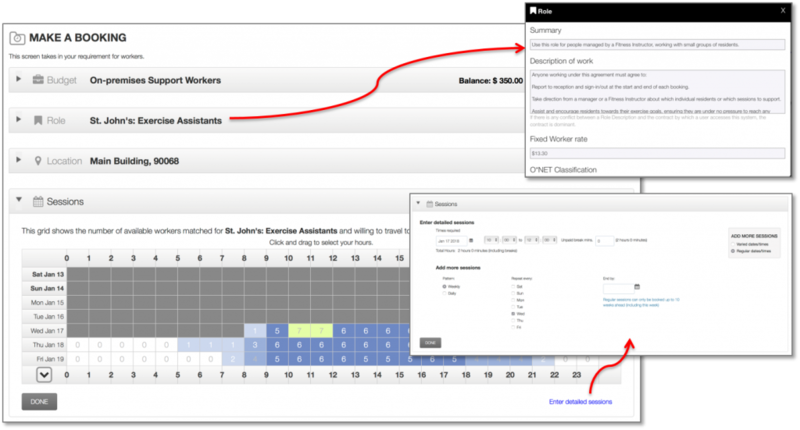 You can change a person’s rating for this work in your organization on the timesheet. Perhaps they had a further induction as part of this booking? 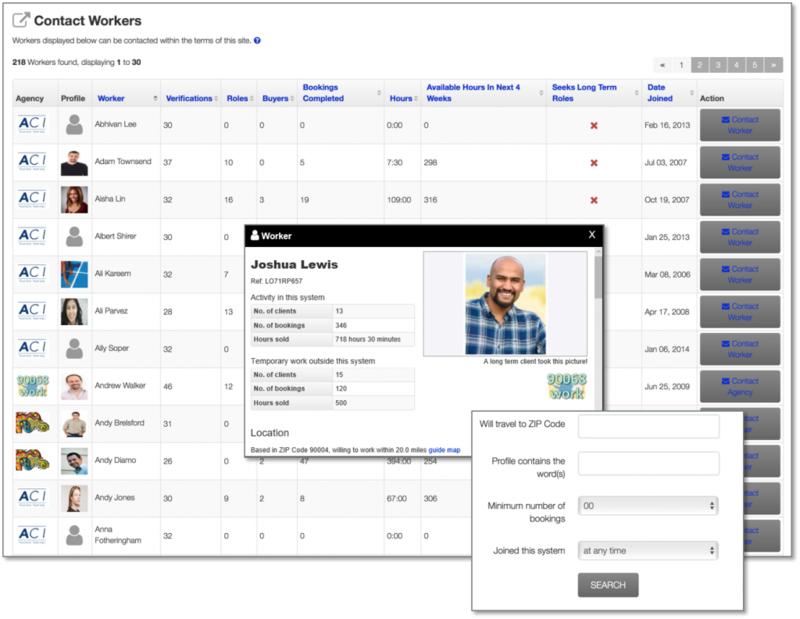 Or you can progress your pool of flexi-workers on a dedicated screen. Intermediaries in these markets could be staffing agencies, employment non-profits, hyper-local enterprises, even a public body. Subject to approval by local market operators it can be anyone ready to vet and payroll work-seekers while acting as their employer-of-record. 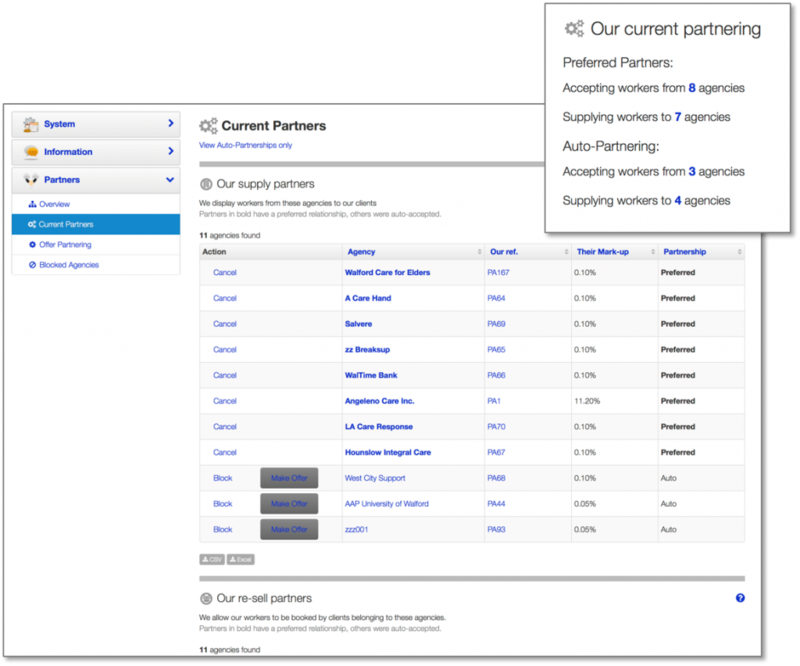 Each of these agencies sets a mark-up built into each hour, paid by the buyer. Intermediaries approve individual work-seekers into the market, confirming their Verifications and setting any limits on their activity. Agencies also decide which buyers of labor to accept under their brand. 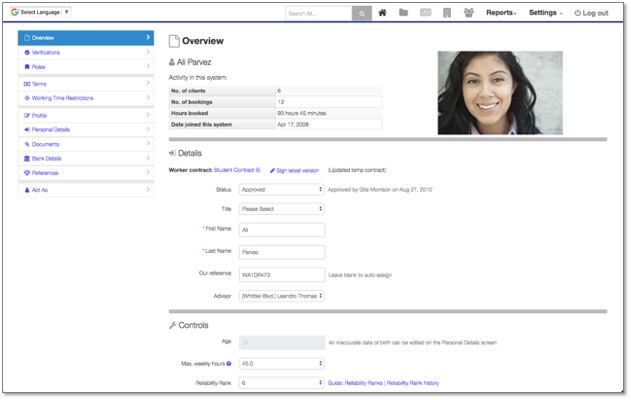 Senior staff at an intermediary have all sorts of reporting tools (pictures show test data). Each intermediary decides if they want to partner with other agencies. Partnering opens doors to more opportunities and allows even the smallest intermediary to immediately access a wide market. Many irregular workers would rather have a traditional job. Having proved adaptability and reliability, they can be a great asset for recruiters. 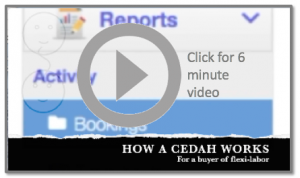 Subject to layers of privacy controls, anyone with a job to fill can search the CEDAH for work-seekers who want to be contacted. Work-seekers might want a relationship with target users of flexi labor (who may also have a path to jobs). Again, subject to each user’s controls, work-seekers can approach organizations or households who they would like to work for.